Recently, we had the 175th Technology Salon in Washington, DC, this one focused on How Can ICTs Improve Our Ebola Response? Be sure to sign up to get invited to our next event. In the lively morning-long discussion with 35 key thought leaders and decision makers from across the technology and development sectors, we came to several interesting conclusions. Even with existing and potential health systems, only 30-40% of Ebola cases will be treated in “official” centers. This means that everyone is a healthcare worker in the fight against Ebola. And in that fight, we need to know our adversary and how to overcome it. However, in our rush to respond, we are reinventing flat tires, and relearning mistakes of the past that we should be beyond by now. The first response responses to the Ebola crisis have focused on outbound messaging trying to inform people about the severity of Ebola and ways to slow its spread. This is understandable, but at last count, there are now over 200 communications with communities initiates, each sending their own messages on Ebola. 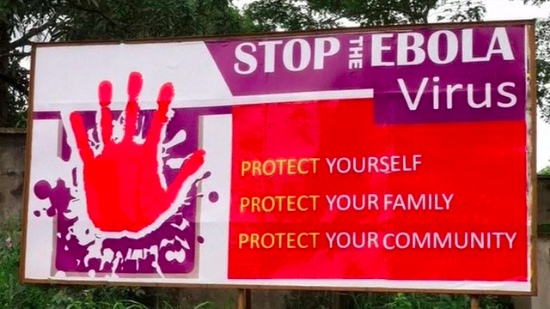 This begs a basic question: where is a Ebola messaging database? Can you imagine what it must be like for Liberians to be on the receiving end of all that? I’m envisioning mobile phones vibrating incessantly with over 100 text messages a day. Might it feel like waves of humanitarian spam? And as someone pointed out in the Salon, we know that one-way communication of the same message over and over again, doesn’t effect change. We need to have a behavior change communication strategy to be effective. One of the key aspects of behavior change communication is to start with trusted members of a community and leverage their established relationships to give legitimacy to the change efforts. And while the BBC is generally trusted, hence their campaign with WhatsApp, they are not local. Better are truly local community members, like the church. While many in the development sector shy away from working with religious leaders, we are remiss to ignore the power of the pulpit. Where a BBC text might have some weight, the word of a local pastor will carry much more significance, especially around caregiving and burial practices, which are at the core of Ebola’s spread. In Sierra Leone, the government converted a little-used hotline into a national call center to coordinate its Ebola response. Predictably, the scale up was not without its challenges, however, its now handling thousands of calls per day and is a core tool in combating the spread of the disease. Public anger is one challenge it is helping overcome. Over 70% of the initial calls were prank calls – citizens angry over Ebola and venting their frustration with the call center staff. Now the staff a being trained on how to deal with and channel citizens frustrations, and they are starting to work on contact tracing, a Herculean task. 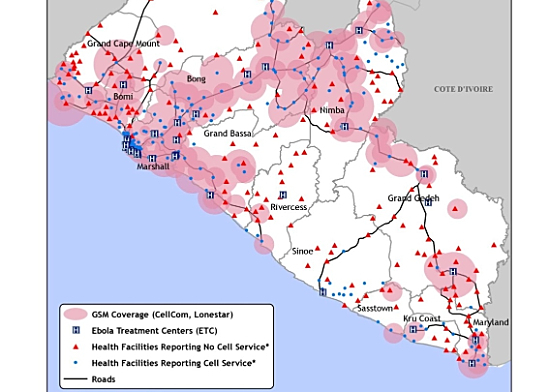 In Nigeria, health workers traced over 19,000 contacts to contain 20 Ebola cases. With thousands of infected patients in Liberia, Sierra Leone, and Guinea, their potential contacts could be in the millions. Contact tracing should be a key role for ICTs, and there are several notable initiatives, yet more could be done. Especially to build the capacity of the national healthcare systems, which were not very strong to begin with. Luckily, countries like Sierra Leone and Liberia already have tools like DHIS2 and iHRIS to manage their health systems, such as they are, but Ebola is taxing them beyond capacity. In our response, we need to build on these existing systems with tools that can be immediately useful, which often means pre-existing vs. newly created ones, and useful even after Ebola. As one person pointed out, pregnancy and malaria are still killers in West Africa, and will be long after Ebola is contained. With so many ICT resources aimed at Ebola, you would think here would be seamless coordination between efforts. You would be wrong. 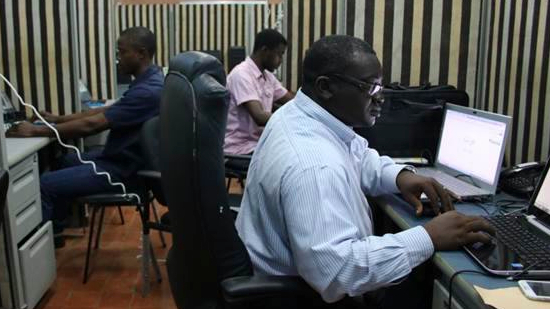 The technology infrastructure in Liberia is nascent at best, as USAID found in their ICT for Ebola review. In fact, with spotty mobile data availability, there is still too much key Ebola data riding around on backs of scooters. When data finally moves into the cloud, its often not standardized, which is an opportunity for WHO, USAID, the UN and others to mandate data and systems interoperability from the start. That alone, would be a long-lasting benefit for when we have contained Ebola. Finally, while this feels like our darkest hour, remember that it often comes right before the dawn. Ebola is horrible and devastating, but we will contain it, as we have the plagues that have come before and will come again, using all the tools of technology man can devise. 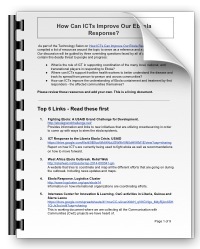 In preparing for the Salon, we complied a Ebola Resource Document – 8 pages of links to blog posts, news articles, and other publications detailing the ways ICT can be used in the ongoing Ebola response. Its a living document – add your links to other activities and initiatives using technology to fight Ebola.